I present here The reference intervals and normal ranges of hcg levels in a table FOR B-HCG IN PREGNANCY calculated by weeks after normal last missed menstrual period (LMP) and by days post ovulation date (dpo), I listed in this post many detailed and concise charts of the hcg beta-subunit ranges to guide every woman to know the health of his fetus and the most accurate date of gestation and birth. All charts of hcg levels in the concentration unit mIU/mL which equal to IU/L. 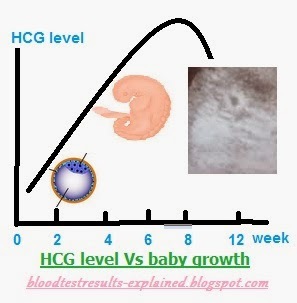 The hcg level can be detected by any blood test using a chemical assay after 6 – 12 day after successful fertilization, hcg peak early in blood then exceeds by the day 8 – 12 to exist in a urine tests. What does HCG beta subunit means? Learn how to understand hcg test results. Why hcg level charts is vary in numbers? hcg level pregnancy charts vary according every Lab and by concentration unit of beta hcg subunit. At any hcg level chart when hCG < 5mIU/ml is considered NOT pregnant and the hCG level >= 25mIU/ml is considered pregnant, however 90 % of pregnant women have an hCG level doubles in concentration every 2-3 days (48-72 hours). What is the best chart of hcg levels to calculate my pregnancy age? You can choose any chart from the below ones as you knew your last missed period date and ovulation date. Learn how to calculate days post ovulation? Learn how to convert LMP chart to DPO chart? How to convert hcg levels chart by weeks to hcg levels chart by days? Most charts of human gonadotropin hormone give in gestational weeks, e.g. 3 weeks after beginning of menses = 3 weeks from last menstrual period (LMP) = 1 week after ovulation (DPO) = 1 week before period is due, in a standard 28-day cycle period. In women who are having a multiple pregnancy, twins pregnancy or more it is common for their hCG levels to be 30-50% higher than those with a singleton pregnancy. But this elevation is not evident until after the first period is missed. A very rapid increase in hCG levels can be cause for concern but not accurate as well. hcg level chart in early pregnancy. What should your hcg level be if you are 5 weeks pregnancy? In the day post ovulation chart the 5 weeks post gestation (LMP) are equal to 35 days and if your menstrual cycle is 28 days then 5 week LMP is corresponding to the day 21 dpo, so that the hcg level in the day 21 post ovulation is a number around 1248 IU/l, if your period cycle is 30 days then the ovulation starts at the day 16 of LMP and the 5 weeks LMP must be arounf the 23 dpo and hcg level will be 2439 IU/l. What is hcg level for a woman who is 6 weeks pregnant? 6 weeks of pregnancy means 6 weeks post gestation (LMP) and 28 days post ovulation (DPO). Read carefully charts data before calculate yours and rememebr your missed period date and ovulation date for better calculation. The sonogram or U/S sonar imaging is the most sensitive method to know most baby data. Triple test is most frequent screening tests during pregnancy period. Learn how to follow pregnancy by tests? Learn why some pregnant women get odd number in hcg analysis?